This card was created especially for my Mum-in-law. The pattern is by Sjaak "Stitch and Do" Card only set 21. Hobbydots and Merry Christmas stickers have been added. I hope that you are all having a wonderful week. Thank you fo coming by and looking at My Craft Cupboard. A beautiful new pattern by Ann's Paper Art. The pattern is available in the Hobbyjournaal Yearbook 2017/2018. I decided to make a Christmas card with the new pattern. Threads are Mettler Polysheen 0821, 2320, 5833. Decoupage by Ann's Paper Art - APA3D002. Peel off stickers have also been added. 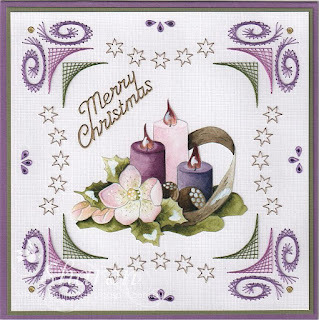 This card was especially created for Annalie and her husband, they live in South Africa. 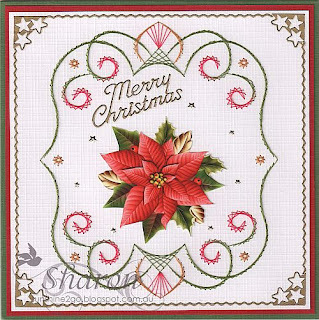 Pattern by Sjaak "Stitch and Do"card only #21. Threads are Mettler Polysheen 0622,2101, 5933. 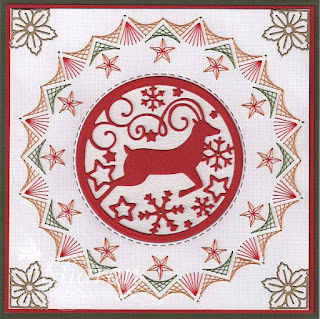 Reindeer die by Sue Wilson "Festive Collection" CED3119. Poinsettia stickers have been placed on the corners. We are having a very wet day up here on the Coast.